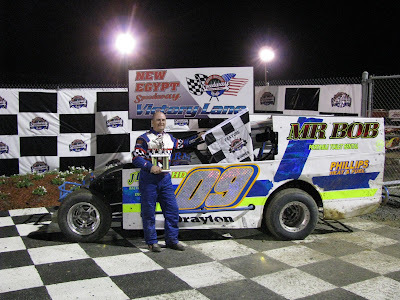 New Egypt Speedway put on another great Modified race on Saturday night. There was plenty of passing and some controversy as well. Bobby Drayton won the Modified feature after starting 20th. Pauch was looking strong early, but after a tough restart with Johnny Guarino that saw Pauch slide from from 2nd to 5th or so, Pauch and Laubach tangled, leaving Pauch with a broken front end, and Laubach sent to the back for overaggressive driving. No excuses for Drayton though. He was right there and came from 20th to 1st. It was also nice to see Johnny McClelland run a strong 2nd. Johnny Mac usually runs an in-car camera, and if he posts the feature video, I'm sure that will be exciting one to watch. Take a look at this Modified Heat from last night to see your typical 3-4 wide passing. This comment is about this guy; NOT this heat. I went down last weekend (7/17/2010)for the first time this year. $20 is a little high for me. I wasn't dissapointed, though, except for not knowing where to look! I wanted to watch this guy, but Pauch and Laubach kept distracting me. He was the show to me. If any one can run harder than Dreyton was running last week.......well, I haven't seen it recently. I would pay $20 to see it again.